Grounded in investigations of everyday design, this study explores the appropriative, creative and adaptive practice of skateboarding as a way to reveal a new perspective on mobile technology and their influence on mobility. We describe how skateboarding, a technology seen as an embodied practice, encourages practitioners to engage with the environment and thereby changes their mobility, even though the technology requires extensive practice and is not easy to use. Comparing these aspects to other mobile technologies offers new directions for the design of mobility and the influence of technologies. _ Hauser, S., Desjardins, A., and Wakkary, R. (2013). 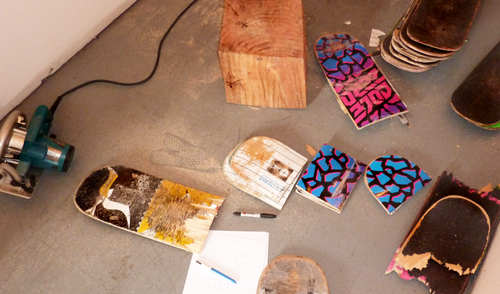 Skateboards as a Mobile Technology, Proc EA CHI 2013, New York, ACM Press, 1419-1424.